try his hand at a comic strip, the prehistoric past suggested itself as a topic. 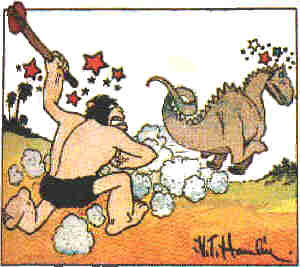 He named his Stone Age hero after words used by French gymnasts and trapeze artists ("Allez Oup"), surrounded him with supporting characters (girlfriend Ooola, pal Foozy, antagonist King Guz, pet dinosaur Dinny, etc. ), and started sending the whole menage out to syndicates. The strip was bought by a small syndicate named Bonnet-Brown, which began distributing it on December 5, 1932 — but less than six months later, Bonnet-Brown was no more, and Oop was homeless. Shortly after, tho, Newspaper Enterprise Association (syndicator of Our Boarding House, Wash Tubbs, Out Our Way and other well-known features) picked it up. Its "official" start date, August 7, 1933, is actually the day it started appearing as an NEA strip. The Sunday page began September 9, 1934. He's been appearing seven days a week ever since, making him among the earliest, and certainly the longest-running cave man in comics. He's far from the only one, of course — Rocky Stoneaxe, Tor, B.C. and Anthro are just a few of the other representatives of that ethnicity who have cavorted through the medium over the years — but he's the only one to travel in time on a regular basis. On April 5, 1939, he and Ooola were being chased by enemies and it looked like there was no way out, when all of a sudden, they found themselves in a 20th century time machine operated by Doc Wonmug. They adjusted quickly, and went to work as Wonmug's field operatives. From then on, whenever Hamlin got tired of Stone Age adventures, he could do a story about the Crusades, ancient Egypt, Caribbean pirates, or whatever else struck his fancy. They even went to the Moon. In 1947, Wonmug sent them there in an experimental spacecraft — and that story has the distinction of being the only one in all science fiction to anticipate the real-life scenario in which the whole world watched the first Moon landing on television. These sci-fi epics happened mostly in the daily strip, tho — on Sundays, he generally stayed in Moo. Alley Oop was never a big comic book star, but he's maintained a presence in that medium. He first appeared there in 1936, in the back pages of Dell's The Funnies, but was seldom cover-featured. He held down comics of his own for brief periods in the late 1940s, middle '50s, early '60s, and late '90s, all from different publishers. In the late 1980s and early '90s, sequences of the strip were reprinted by Dragon Lady Press and Kitchen Sink Enterprises. Reprints from the late '30s currently appear regularly in Comics Revue magazine. Nor did he make it big in non-comics media. There were a few Big Little Books, starting as early as 1935, but no movie serials or radio shows. He was the subject of a pop song by The Hollywood Argyles, which reached the top spot on the charts in the early 1960s. He was animated, but only as one of the back-up segments in a 1971 Archie Saturday morning show, and even there, his episodes rotated with Nancy, Broom-Hilda, Smokey Stover, and other newspaper strip stars. (These segments later turned up in an NBC Saturday morning series called Fabulous Funnies. But the comic strip made so big a hit with fans, that comics' first fan award was named after it. The "Alleys", consisting of a statuette of Oop designed by cartoonist Ronn Foss, were given to outstanding practitioners of the art from 1961-69. And it made so big a splash in the world at large that it was included, along with Bringing Up Father, Krazy Kat, Rube Goldberg's inventions and several others, in the U.S. Postal Service's "Comic Strip Classics" series of stamps. V.T. Hamlin turned the strip over to his long-time assistant, Dave Graue, in 1973, and lived another 20 years in retirement. Jack Bender, a former assistant to Don Martin, became Graue's assistant in 1990, and continued in that capacity until 2001, when Graue retired. Today, the strip is handled by Jack and Carole Bender. Unlike most story strips, Alley Oop has held onto a sizeable chunk of its circulation. At its peak, it appeared in about 800 newspapers, and today, more than 600 carry it. Not bad for a guy who, left to himself, wouldn't even wear shoes. Text ©2000-06 Donald D. Markstein. Art © NEA Service Inc.